No, I haven't broken my vow to take a plant-purchasing hiatus...yet. These are eBay purchases from April that I hadn't gotten around to posting about until now. I find that caring for Neoregelias is fairly easy for the most part. However, I have learned that I must keep the central leaf "cups" filled, or the outer leaves will shrivel. I also find that giving the Neos a supplemental misting at the same time that I mist-water my Tillandsias (air plants) helps. A terrarium might be a good idea for in the future, if I can find a place to put a large one. Neoregelia 'Dartanion' with a pup starting. This plant was actually a surprise bonus sent by the eBay seller when I purchased the other two. Now regarding that hiatus: Though I haven't purchased any new houseplants since May 22, just as I promised, I'm considering moving up the start date of the break. After all, I do have my (50th) birthday coming up, (I'm called Karen715 for a reason.) 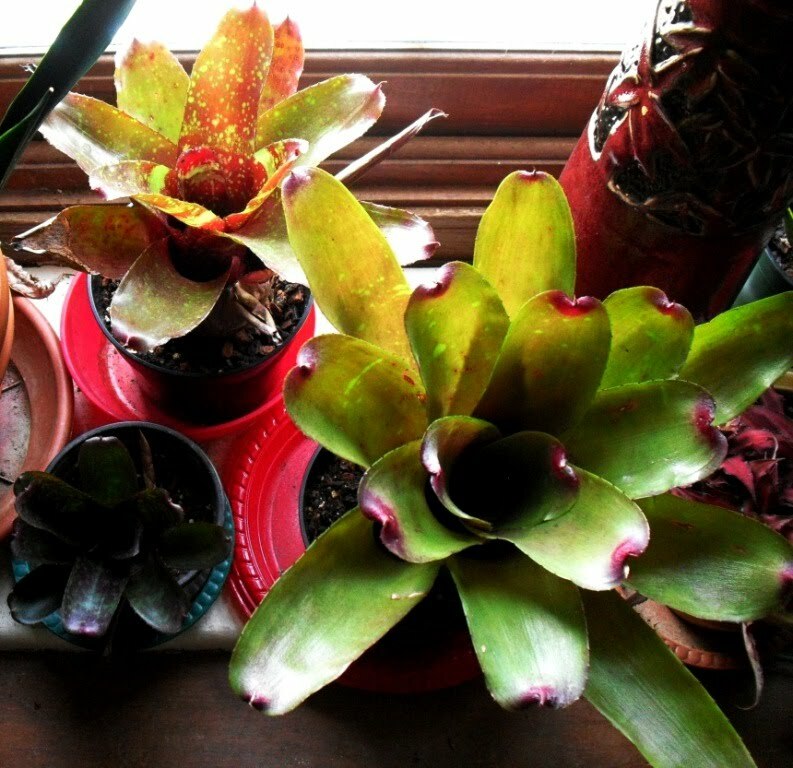 So the new start date for my six-month plant-buying hiatus is now July 16, 2010, to end on January 16, 2011. This doesn't mean that I'm definitely going to buy plants between now and then, or even for my birthday, but I'm keeping my options open. Bromeliads are the best! Your neos are looking great. 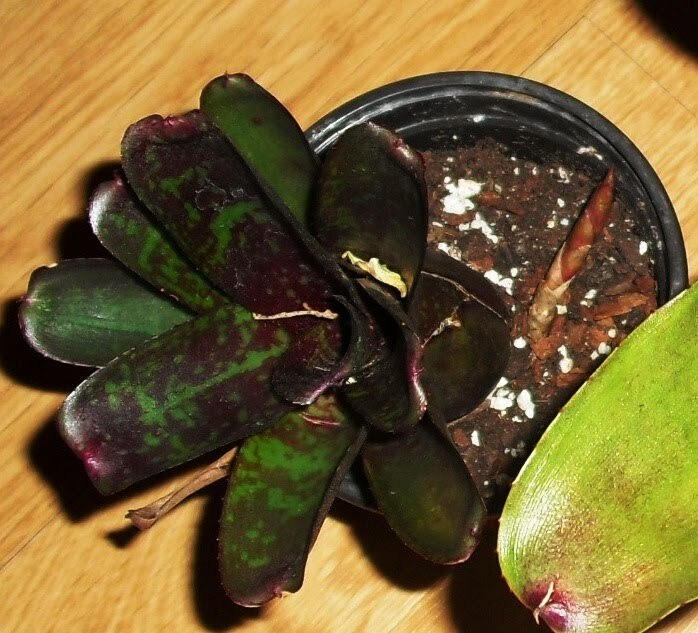 You're going to go six months without buying a plant? Dang! There's no way I could do it. I could never go that long without buying some succulents. I bought some yesterday for bunco matter of fact. I am going to talk about bunco in my next blog post. I love bromeliads too but I don't really have any. I do have a window full of those kind of small bromeliads that you attach to shells and rocks. I water them under the sink about every two weeks. They get flowers and have pups. Not sure if they are bromeliads or not. Yours are really great and love the photos! I can definitely relate to *attempting* a plant-buying hiatus. I never had much to do with bromeliads until I moved to north Florida. It's so cool how they reproduce; I did not know they were called pups--kinda cute.